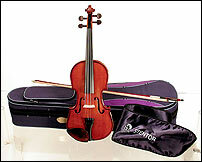 The ideal entry level instruments suitable for intermediate Grades. All are hand carved from solid tonewoods with good quality rosewood pegs and fingerboard and alloy tailpiece with four integral adjusters. The outfit includes a reliable student wood bow and well designed lightweight case with accessory pockets and carrying straps.